Being a big Disney fan, I quickly became a fan of the Anaheim Mighty Ducks once they joined the NHL in 1993. I have never seen any of the Mighty Ducks movies, but I love collecting any Mighty Ducks stuff I can find. Back in the early 90's there was a great shop at the Disneyland Hotel that specialized in Mighty Ducks merchandise and I picked up some great stuff including a video of their inaugural game (they got clobbered by the Red Wings), and a ticket from their inaugural home game sealed in lucite. 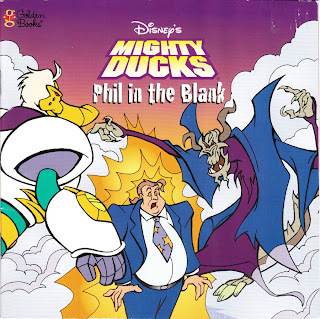 I have kind of lost interest once Disney sold the team and they decided to become just the Ducks, minus the Mighty. But I did find this Golden Book featuring the Mighty Ducks recently and had to pick it up. I guess I can kind of see why they are trying to distance themselves for this image. But come on, the original Mighty Ducks logo is one of the best hockey logos ever and their mascot Wild Wing was pretty cool too!